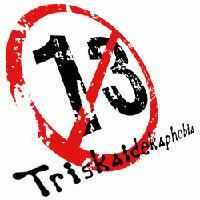 triskaidekaphobia noun fear of the number thirteen. ETYMOLOGY: Early 20c, from Greek treiskaideka thirteen. Once again, thank you Con! It has been pointed out to me that I really shouldn’t have missed the ovine question as I’d gotten it before – and gotten it wrong. Hopefully, I’ll remember for the next time. Questions 6 and 7 are examples of poorly worded questions as they can have more than one correct answer. In the case of 6, the answer could also have been Patagonia, the larger region which contains Tierra del Fuego. 7 is just ridiculous – I’m sure those four countries have many, many things in common. Hitting upon the one that the question setter sought became a case of pot luck and that is NEVER A GOOD THING, in my opinion. Here are the Dingbat answers. Finally I really ought to have thanked my team-mates Ger, Mary and Willie in the original post. They were excellent company and intelligent to boot! Here’s hoping to many more quizzes in the future. 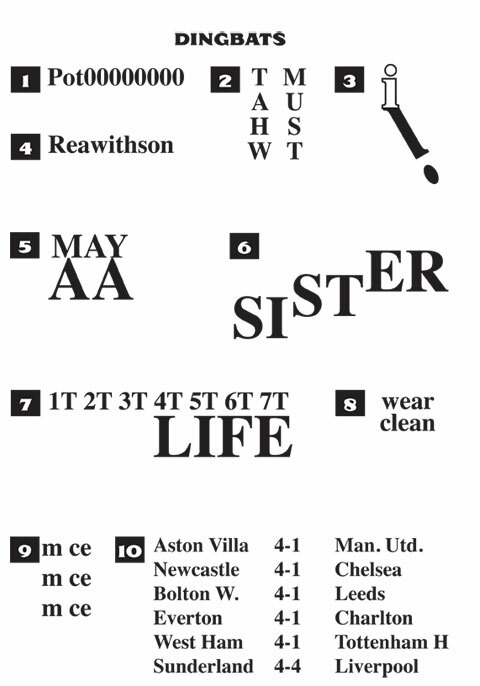 The only one of the dingbats I didn’t get was the last one and, technically, that’s all bar one for one and one for all. Of course though, you know me and football.